The independent body say that Victorian laws, out of step with the modern world, are failing to protect the vulnerable – and not allowing others to distribute their cherished possessions after they’ve gone. 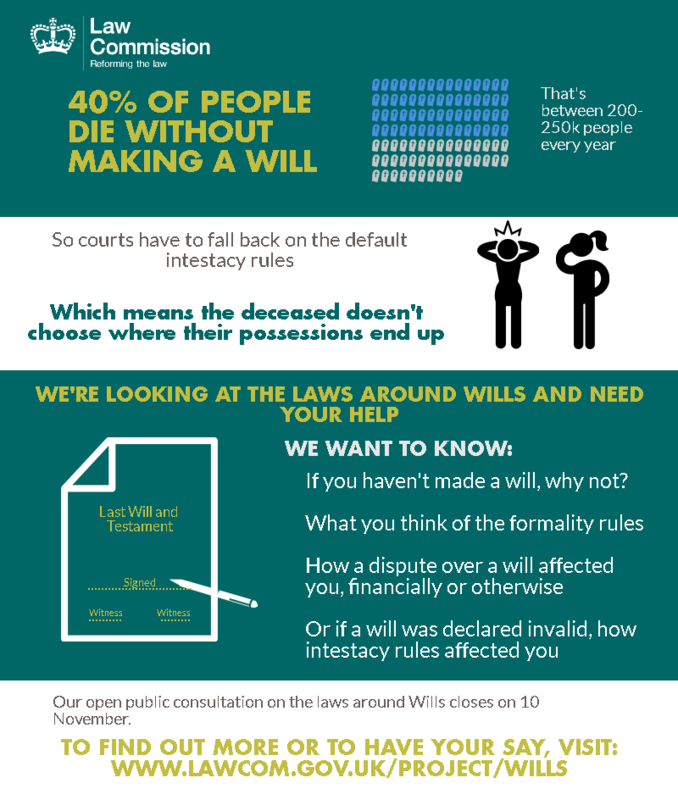 With an estimated 40% of adults dying each year without a will, it’s also thought that the laws could be putting people off writing one. That means there is no guarantee that estates are distributed as the deceased intended. As a result, the Law Commission is consulting on proposals to soften the strict formality rules, a new mental capacity test which takes into account the modern understanding of conditions like dementia, and a suggestion that the age for making a will should be lowered from 18 to 16. “Making a will and passing on your possessions after you’ve died should be straight-forward. But the law is unclear, outdated and could even be putting people off altogether. “Even when it’s obvious what someone wanted, if they haven’t followed the strict rules, courts can’t act on it. And conditions which affect decision-making – like dementia – aren’t properly accounted for in the law. A person’s will is an important document. People use wills to choose how to distribute all of their possessions and often to express preferences about what happens to their bodies after death. Certain procedures must be followed in order for a will to be valid. But if the formal rules aren’t followed –even when it’s clear what someone’s intentions were – people’s dying wishes aren’t acted on. Wills are also only valid if the person writing it understands what they are doing – however the law uses a Victorian test which takes no account of modern medical understanding. It focuses on “delusions” of the mind; doesn’t reflect the understanding of conditions like dementia where mental capacity can be changeable; and differs from the modern test for capacity in other areas of decision-making – the Mental Capacity Act 2005. Many people might also not be aware of some of the law of wills. For instance, when someone gets married that process revokes any previous wills. So if someone had made specific provisions in their will – to support children from a previous marriage for example – these would be ignored and the new spouse would receive the bulk of the estate. Giving the court power to recognise a will in cases where the formality rules haven’t been followed but the will-maker has made clear their intentions. An overhaul of the rules protecting those making a will from being unduly influenced by another person. Applying the test of capacity in the Mental Capacity Act 2005 to the question of whether a person has the capacity to make a will. Providing statutory guidance for doctors and other professionals conducting an assessment of whether a person has the required mental capacity to make a will. Giving the Lord Chancellor power to make provision for electronic wills. Lowering the age at which people are able to make a will from 18 to 16 years old. In its consultation the Law Commission also asks the public what the main barriers they see to people making a will and to tell it about their own experiences of disputes over wills following the death of a loved one. The paper also asks whether the rule that marriage revokes a will should be retained or abolished.